So it's parading season for me, which means that I'm packing up a lot of gear for travelling and one thing I don't like to go without is power. Charging my phone, my watch, bluetooth headphones, etc... That means bringing a bunch of of those USB blocks to charge each device. Thankfully there's this little gem of a travel sized charger that will take up to 6 ports and supply each of them with 2.4A (meaning we'll get a decent speed on the charge). 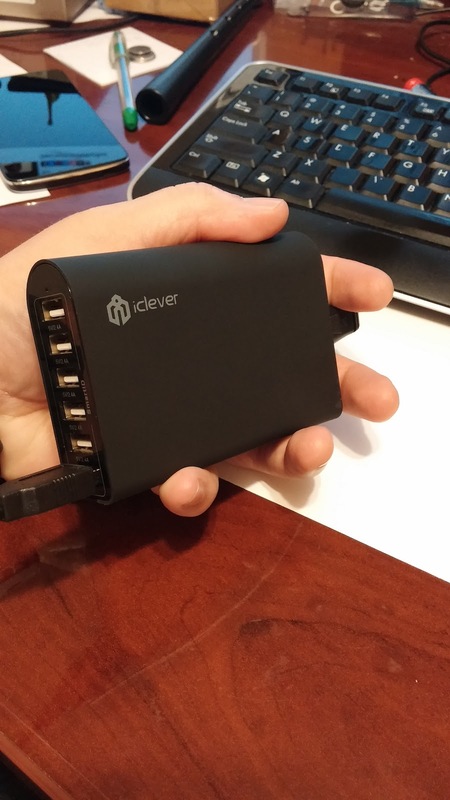 iClever's 50W/10A charger is the perfect size to fit in any backpack or travel bag and not take up a ton of room. At $30 it doesn't take up a lot of space on your wallet either. The only weird thing about it I would say is that to me, the USB ports are upside down, so I always was trying to put them in the wrong way. No biggie tho'. Personally I like to buy some extra microUSB cables and just leave them plugged in all the time. In the end, if you travel lots and take lots of those 'warts' (yup, sometimes they're called that), forget that and just bring this one.